Life is better with elegance! 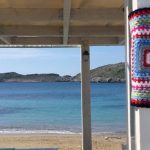 The Goldfish is an exciting, vibrant café restaurant situated by the sea, in Kapsali, Kythera, a stone's throw away from Kapsali beach. Serving freshly prepared, seasonal dishes, Dimitris Baltzis, the restaurant owner, prides himself on delivering high quality food in a relaxed and friendly environment. The staff here are delightful, friendly and accommodating, nothing is ever too much trouble. The Goldfish has a delicious, uncomplicated menu with pasta, salads, burger and snacks and an excellent choice of sweets, wines, beers, cocktails, soft drinks, smoothies and handmade lemonades! Our food is handmade, using seasonal ingredients and only the freshest produce which is locally sourced where possible. We go to every length to ensure our high standards are maintained and we are proud to say that our food tastes great. Whether you’re in the mood for Greek, Italian, Mexican, American, Chinese or all of the above, our choice of dishes, drinks and sweets from the globe is bound to please everyone from families to foodies.